Nicole wore a protective shield after her vitrectomy. I recently featured Nicole on www.boldblindbeauty.com in recognition of National American Diabetes Association Alert Day to bring awareness to the issue of Type 2 Diabetes. Nicole, who has Type 1 Diabetes found out first hand just how devastating this disease can be on the body. Among other issues that she deals with on a daily basis over the past couple of years, she’s been fighting to save her eyesight. Thankfully Nicole got a reprieve in the form of good news as her left eye is now stabilized. While this is an excellent report, her battle continues. If you or anyone you know has diabetes it is critical that you take good care of your body to hopefully avoid significant diabetes health-related issues. “But you don’t look blind” Many of us blind/VI ladies hear this quite often, especially if we are stylish and walk confidently with our white canes or guide dogs. But here’s the thing, if someone told you they had cancer to say “you don’t look like you have cancer” would be considered rude. The same holds true for blindness and many other disabilities. Fact is there are many fashionable and attractive women who happen to be blind. The thing that sets us apart is we refuse to let our lack of eyesight prevent us from living life on our terms. I think it’s important for all of us to remember things aren’t always as they might appear. 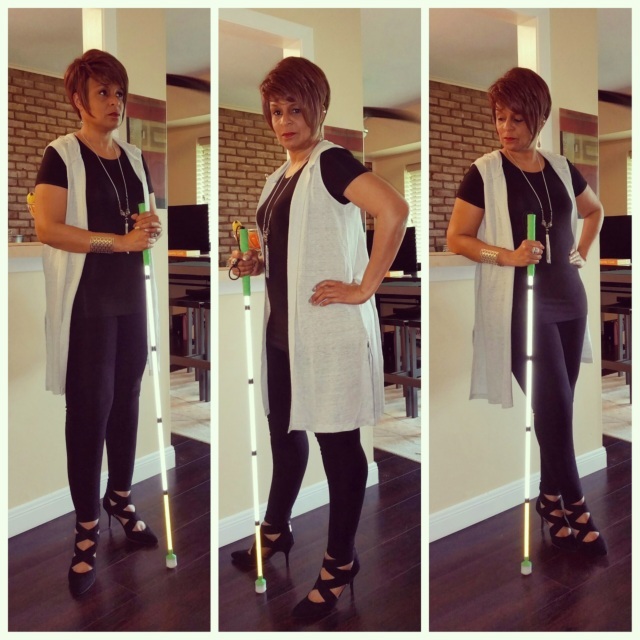 I am posed standing in this photo (a collage of three images) with my white cane. My outfit is a black tee, black leggings, black crisscross heels, gray long hooded vest. Another tri-collage where I’m standing with my white cane against my counter in the living room. This time I’m wearing all white (jeans, cami, open shirt) with beige block-heeled lace-up sandals. A silver cuff bracelet, statement necklace, and earrings complete the look. This morning when I was walking Mollie (my furkid), a small group of people walked by on their way to their daily destination. I knew who they were by the sounds they made so I turned towards them, smiled and waved “good morning,” to which the one young lady waved in return. After our brief interchange I began thinking about communication and how our disabilities can play a pivotal role in how we connect with one another. It also occurred to me that I probably never would have given this aspect of communication another thought had I not lost my vision however I am grateful for this bit of enlightenment. If you’re introverted you understand how uncomfortable social situations can be when you meet new people. I can tell you from first-hand experience there have been times I literally would have preferred the floor to open and swallow me whole as opposed to putting myself out there – it’s a downright scary predicament. Body language and eye contact speaks so loudly but when you can’t see it becomes a whisper at best, and mute in the worst case scenario. The same could also be said of audibly communicating without sign language or speaking directly to a person who is deaf, blind, nonverbal or a combination of these three. I’ve always been fascinated with the complexity of communication and how people understand one another. When we all speak the same language and share common characteristics, for example culture, the odds of our understanding what we are communicating greatly increases. However when we encounter a person who doesn’t speak our language what do we typically do in an attempt to get our point across? Out of habit I do this even when I’m talking with my friends and that is, pantomiming or gesturing wildly. But what about the person in this same situation who has no arms? Just something to think about. Communication in the digital age has significantly increased the likelihood of being misunderstood not only because of the oodles of acronyms on all social platforms, but even the way we look, speak or write can have a major impact on what we are trying to convey. Just turn on the TV or look on the web and there are many instances of someone saying something that was intended to mean something else entirely. Intention is at the heart of communication. What is the objective you hope to achieve? I began this post by talking about the group of what I think are young people (this is just a guess because I can’t see them) who happen to be deaf/mute. Though I do not know sign language, the universal gesture of hello, a simple wave of the hand along with a friendly smile, is my way of saying “hi, how are you, have a great day.” When I get a reciprocal response I’m assured that my message was received and understood. When I’m getting ready to go to an event or just a simple outing I take great care in how I’m going to present myself. I do this for two reasons: 1) I need to feel good about how I look and 2) I want to project an “I care” attitude to others. Why should I care what other people think of how I look? Because how I dress is partly a reflection of how I feel about people. Being unkempt would certainly be an indication that I don’t care about myself but it also says that I don’t have much respect for those around me. When I used to take public transportation and would see regulars getting on the bus to go to work looking a hot mess, I got irritated. Though there is a segment of the population who really don’t care how they portray themselves, for the rest of us, people do notice. Now I’m not suggesting that you break out the Sunday’s Best, rather I am proposing putting a little thought into the message you want to transmit through your appearance. In the pictures included with today’s post I’m communicating my *Ahem* vitality (admittedly I am not a colorful person but I have my moments) by wearing a vivid orange top with white capris and orange slingbacks. I topped the look with my white Nike ball cap and a few accessories then I was good to hang out with one of my gal pals on a recent Saturday afternoon. The sheer, lined, crepe top is almost halter-like with braided straps and button keyhole closure at the back of the neck. Since the top is flowy I opted to wear it untucked over the rhinestone-embellished (at the outer hem) capris. The toe of my slingbacks is orange, accented by thin purple straps. I also wore a black and silver pendent necklace, silver cuff bracelet and silver drop earrings. Bright colors and whites immediately lift my spirits and make me feel more energetic. If you want to get noticed or lighten your mood, just add a pop of color, be it a top, bottoms, dress, shoes, or accessories. So what are you communicating today? You can respond by leaving a comment or emailing me directly at boldblindbeauty@gmail.com.